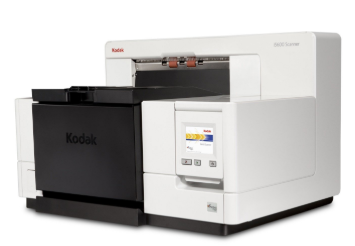 Kodak i5650 is a productive, reliable and powerful document scanner that is perfect for scanning large volumes of A4 / A3 paper documents. The Kodak i5650 is capable of handling limited document volumes, because of the throughput speed of 180 ppm, the ADF capacity of 750 A4 / A3 sheets and ultrasonic double feed detector. Kodak i5650 is a perfect production tool. Kodak i5650 has a touchscreen simplifying interaction with the scanner. The function keys are configured to minimize user intervention, save time and improve accuracy for repetitive and complex scanning jobs.